I have said and done many things to prove that statement correct, only to later realize that it doesn’t and shouldn’t be regret that follows #Action but a deep understanding that the choices we make make us. This quote stirs up some emotions in me from a heated discussion I had this weekend. An old buddy was in town and we met up downtown for some drinks after a concert. He’d met up with some random new people and everyone was having ‘New Acquaintance” conversations in a relatively loud bar. It came up in conversation that a majority of us were combat veterans, but one of the “New guys” was a patriot civilian with a passion for PTSD. In fact, I believe it was the first question out of his mouth to me. “Do you have PTSD?” The question didn’t really phase me, because although I’ve seen and been through some very intense training and real-life situations, I am very well-adjusted and have sorted out my emotions on the things I’ve done and seen. I do not have any lingering illness. The guy kept pressing, and it was pretty interesting to hear his side of the issue. He ultimately came to the conclusion that he wants to make sure that vets get treatment and not outcast when they get back from combat, and if they need help, they need a better level of care. In the heat of the discussion, I had to think long and hard before saying anything because as Epictetus said, I know that words can’t come back. I wasn’t against everything he was saying, in fact, we agreed on plenty, but his tone… It was as if the man wanted every vet to be psychoanalyzed because surely, “You’re all fucked up when you come back.” Hearing that, I couldn’t simply say nothing. He needed to hear something from someone who’s been through hell and kept on moving. You see, some people won’t talk about it. Some people will. Some will only talk to others who have “been there” and some people are ok. That demographic, the people who are ok, need to know that they are not somehow different, weird, or other than human. They should also not develop hubris and think that they are somehow Superhuman. He said to me, “I feel bad for your guys…” and I said, “That’s just it, You feel bad for me for having been through some of the most trying times of my life, and I appreciate the sentiment, but honestly, I feel bad for those of you who HAVEN’T been tested in such a way. You have no idea how strong you can be….” And I let that linger. People who can handle incredible amounts of stress and life and death decisions are not liars who will hide their pain and emotions. The notion that EVERYONE is fucked up is false. Plenty of people can compartmentalize their experiences and learn, even grow from adversity. Check out Nassim Taleb’s Antifragile for a full treatise on the idea that it takes tests, and shocks, and struggle to become more than robust. Some things GAIN from disorder, rather than degrading. @byreginatv posted this meme today, and it’s poignant. We all come from different places, and surely I can’t speak for everyone who’s had traumatic experiences, as we all sailed from different ports, but maybe if one other person reading this needs to hear that “it’s ok to be ok” then that’s good enough for me. Life is an adventure. It can be interesting, terrifying, awe-inspiring, and downright difficult, but it’s important to realize that it’s precious. Our time here is but a breath, and it’s up to us to seize the moments we have any craft them into the stuff of dreams. Engage, #Act, and keep up the #hustle. Tonight people all over the world get together at bars and clubs and pubs and the like to escape reality for a moment. Why escape? Better yet, why only a moment? What if the escape could be for good, and you no longer had to punch the clock on Monday? 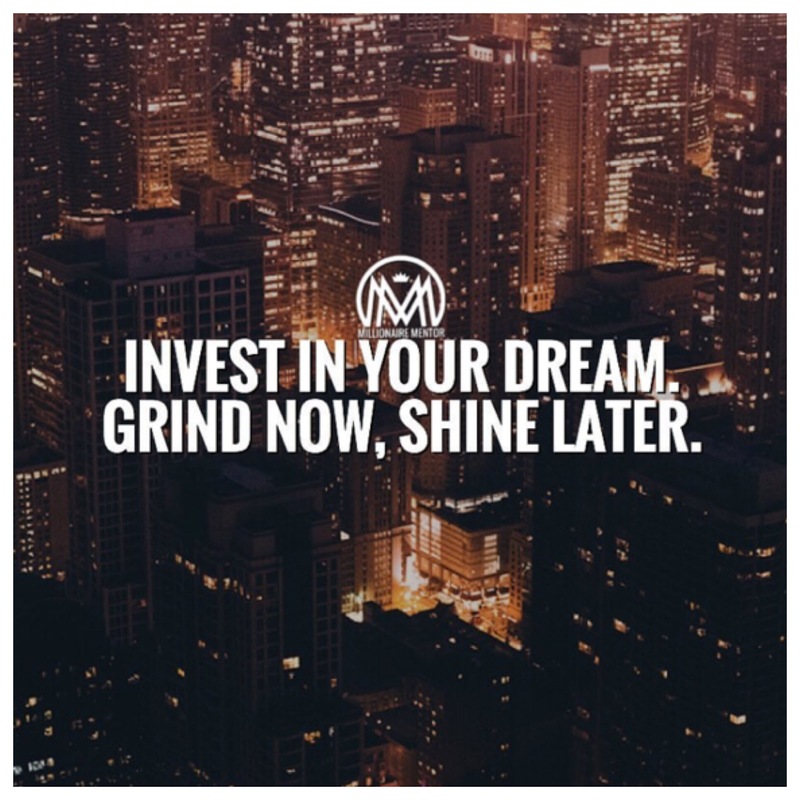 Would you forgo the over-priced drinks and music so loud you can’t even hear the people you are with…if you knew that a better future could come from hard work and #hustle now? Marcus Aurelius said, “Everything’s destiny is to change, to be transformed, to perish. So that new things can be born.” Put another way, “We all have two lives. The second one starts when we realize we only have one…” When entrepreneurs talk about having a “sense of urgency”, this is what they mean! Speaking of grind, time for some coffee and personal development reading. #hustle on you #Action heroes! I’ve become a human doing rather than a human being. I don’t know when it happened but I imagine it’s been going on like this for quite some time. You see, I’ve got a fantastic to do list. To be quite fair, my #bulletjournal is awesome, it’s a combination planner/tracker/journal/note keeper that keeps my productivity running on all cylinders. Did you notice that all of those things I mentioned are #Action-oriented. To do lists are awesome for getting things done because in the fog of “what should I do now?” Or after a disruptive phonecall, or kids spill or whatever cognitive trap you find yourself in, having the list to go back and re-cage is awesome. That said, you are just DOING at that point. There is an incredible feeling when you get into the groove or “FLOW” and are cranking out work. Some multi-tasters or task switchers are able to maximize and optimize their performance with a cup of coffee and a written plan. That is all well and good, but I realized that the high wears off and even the best laid plans in journals become stale and boring and repetitive if it’s all about DOING. For that reason, built into my TO DO, is a distinct personal development section of TO BE. This didn’t have a title before tonight…it was simply a compilation of “dailies” that were bits of science, philosophy classical, western and eastern, and reflection on gratitude. That’s right, I’m using my own personal OCD-ADHD against myself to build personal development into my day as a purposeful TASK. I’m going to force myself TO BE a human being by leveraging my love for being a human doing. Can you help but grin at the idea of positively tricking yourself into being awesome, or at the very least more worldly and exposed to thoughts more meaningful than the latest meme or tweet? In Antifragile, Nassim Taleb discusses how older things, books, ideas have withstood the test of time and proven, by not being replaced, that they are superior to the latest fad or trend. He goes into mathematical proofs that determine how long something will be around based on how long it’s been around and prescribes a diet of old world knowledge. In a lot of ways, his advice to avoid Neo-mania, is so counter-culture I can’t help but think he’s got to be on to something. I want to have the next big idea as much as the next Type A, go-getter MBA out there, but it would seem there is nothing new under the sun.